Today was a full second day and we had a wonderful itinerary. Mass at St. Clare’s in Assisi, a tour with a local guide who was a REAL believer whose brother is in seminary to be a priest. The “spirituality” of local guides is essential which is why we tolerate NO guide who is not a true believing Catholic. I told Janet and my conversion story on the drive to Rome along with the Rosary and time for a nap :-) It was fun to see everyone’s eyes the first time they saw the Dome of St. Peter’s. For Fr. Bryan Hersey’s homily today in the Church of St. Clare above her tomb, click here. Enjoy the video of today and stay with us for our amazing days in Rome. Tomorrow we have the General Audience with the Pope and lots more. 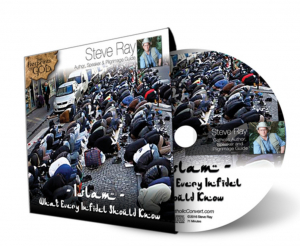 Without holding back any punches or “uncomfortable truths” Steve exposes Islam for what it is and gives the politically incorrect explanation of Muslim beliefs and practice. Steve’s New CD available now for Pre-Order. CD’s will ship in mid-July. All orders of multiple items containing the pre-order will ship together. Want the mp3 version? Find it HERE. Is Islam religious or political? Is it really a religion of peace? Is jihad just a tool of radicalized Muslims? What really drives Islam? Do Catholics and Muslims worship the same God?  Why should Catholics (and all other “infidels”) be concerned? Steve sets political correctness aside to tell the truth about Islam. Beginning with a brief history of the religion, Steve explains the dramatic differences between Islam and Christianity. You’ll learn why Muslims cannot ultimately be assimilated into Western society as popularly believed by fashionable society.